This lightweight Trooper saddle could be the most comfortable M & W saddle yet! The Plush Lite M & W Trooper Saddle is constructed of a super soft, durable calfskin with foam padding backed with 1000 Denier Nylon Cordura for added durability. Built on the same sturdy tree as our original M & W Trooper Saddle that is guaranteed for a year against breakage. The Plush M & W will provide an even more comfortable ride & durability you have grown to enjoy in our M & W Trooper Saddle. This saddle is outfitted with many different fittings for attaching multiple accessories. Solid Brass Hardware throughout and extra wide lightweight trail stirrups provide added comfort for knees and ankles. This saddle is built for the serious trail rider that appreciates quality and comfort. Available in Black or Havana in 16" or 18". The trouper ultra light is by far the most comfortable saddle I have ever owned. I ride trails for 1-6 hours at a time. I live near New Orleans and also ride in parades during Mardi Gras for 5-6 hours on concrete streets. Since owning your trouper saddle, by backside has never been saddle sore even after rough workouts. 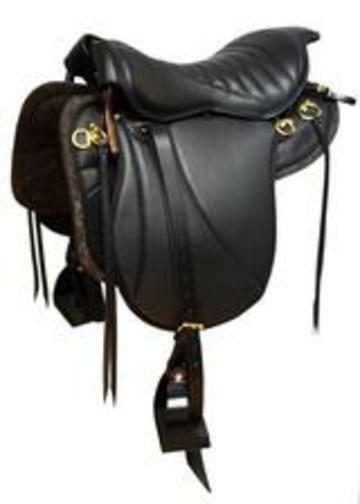 I have tried a "trouper" saddle crom another major saddle maker and it was no where near as comfortable. Thanks for a great product. Have this ultra lite saddle in black. Have to admit I bought it second hand, but the previous owner only sold it due to a long term illness. It is the most comfortable saddle I've ever had the pleasure to ride on. I usually ride for 3-4+ hours at a time and have never been saddle sore (with this saddle), including when I ride parades on concrete for hours. I have recommended this saddle to many friends and have shown the M&W tag and phone number so many times I know it by heart. This saddle is easy to keep clean and the availability of replaceable parts is outstanding! Saving for my second one now for my husband!